And The Tista (Teesta) Weeps! 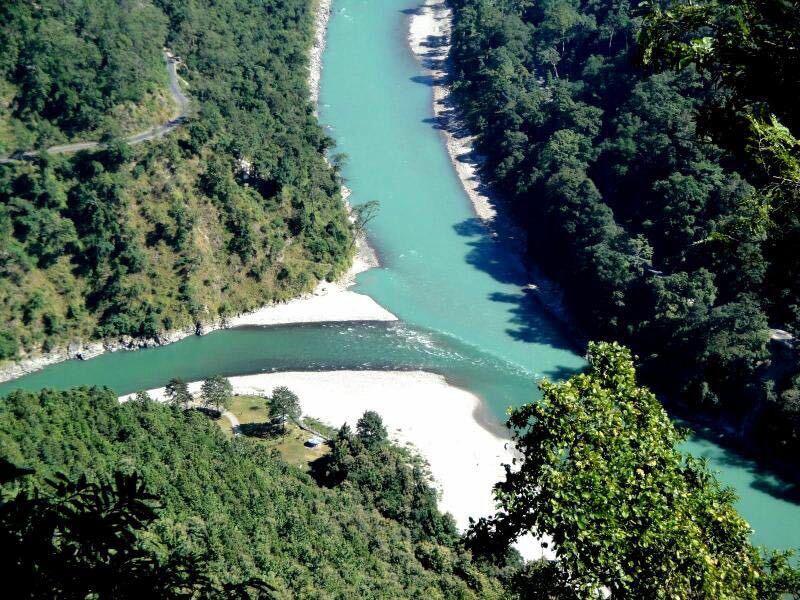 The Tista or Teesta River often regarded, as lifeline of Darjeeling – Sikkim Himalaya is one of the major rivers flowing the Eastern Himalayan landscape. It is the fourth major river after the Ganges, Brahmaputra and Meghna in the Eastern South Asian region. Tista originates in the Sikkim Himalaya as Chhombo Chhu from a glacial lake Khangchung Chho at an elevation of 5,280 meters in the northeastern corner of the state. The lake lies at the snout of the Tista Khangse glacier descending from Pauhunri peak (7,056 m) in northwestern direction. However, many scholars consider Tista Khangse glacier and Chho Lhamo as the source of Tista. It flows the entire length of Sikkim and carves out some of the profuse and verdant Himalayan temperate and tropical river valleys. As it flows down, the river forms the border between Sikkim and West Bengal. Tista flows about 172 km in the hilly region of Sikkim and Darjeeling (India); the river runs for about 98 km in the plains of West Bengal (India) and another 134 km in Bangladesh before joining the great Brahmaputra in Bangladesh. The river drains a total geographical area of about 12,159 km². Around 2,004 km2 of the basin (or about 17 percent) lies in Bangladesh with the rest of the basin area being in India. As it traverses from its source to the plains, Tista receives water from a large number of tributaries on either side of its course forming a complex and dynamic river basin and therefore a unique eco-region fittingly referred to as ‘Tista Eco-region’. The tributaries joining from the eastern flank are shorter in course but larger in number and have lesser volume of discharge whereas the tributaries on the western flank are fewer in number but much longer with larger drainage areas, thus contributing more amount of discharge to the main Tista River. This is so because right-bank tributaries drain heavily glaciated areas with sources in large snowfields. The left-bank tributaries, on the other hand, originate from semi-permanent and much smaller snow-fields as compared to right bank tributaries. Tista River Basin has been home to several social groups in Sikkim, northern West Bengal (India) and Bangladesh since historic past. Starting from the Lepcha Tribe, Ethnic Bhutias and the Ethnic Nepalis in Sikkim-Darjeeling Himalaya to the agrarian communities of North Bengal and Bangladesh, Tista Basin is the source of livelihood for several socio-cultural groups. Further, Tista has been the source of etho-cultural and ethno-religious basis of many social groups in Darjeeling-Sikkim region. Tista River is a major and only source of water to agricultural crops of the thirsty Northern Bengal and North Western Bangladesh. However, the historic symbiotic and intimate human-environment relationship between people and natural resource bases including water in the Tista Basin has been increasingly put to danger by diverse undercurrents of development in recent times. This has resulted in the imbalances in the environment and various ecological systems there in. This is a very serious issue both to our coming generations and us. It is important to understand that all the parameters of the environment are intimately interrelated and a change in one will negatively affect the other. Besides other forms of development including expansion of agriculture and irrigation, construction of roads and buildings, urbanization etc, the Central and Provincial Governments of India are forcefully underway with series of hydropower dams within the Teesta River Basin (TRB). Consequently, the Sikkim-Darjeeling catchment of the Tista Basin is expected to produce over 6000 MW of electricity within the next few decades. Ironically, the first Human Development Report (HDR) of Sikkim (2001) authored by Mahendra P Lama, then Economic Advisor to the Chief Minister of Sikkim, strongly advises Sikkim to harness rich water resource of the Sikkim Himalaya. The report further recommends state government to take help of private sector towards this end (page 77-84). The State Development Report of Sikkim (2008), takes similar stand as taken by HDR, 2001 (page 109-119). Both the reports cite the success of Chukha Project of Bhutan as an example for the development of hydro resource of Sikkim. There are concerns that building of Hydro-dams may lead to river-induced seismicity in this geologically young and tectonically active region besides several other environmental, socio-cultural and socio-economic fallouts because of their little scientific basis. Further, there have been serious issues on table with regard to sharing of Tista water between India and Bangladesh. Besides several existing and proposed hydro-dams in the Sikkim-Darjeeling Catchment, the Government of West Bengal has diverted almost entire Tista Water via artificial canal at Tista (Gajoldoba) Barrage in Jalpaiguri to irrigate its thirsty North Bengal leaving little or no water for Bangladesh. As a lower riparian country of the basin, Bangladesh has been regularly voicing its concern for the equitable sharing of the Tista River. But it is still to be achieved despite several meetings between Bangladesh and Indian governments. Experts often project that the next 10-15 years shall witness depressing intra and inter-State water disputes if policy makers both in India and Bangladesh do not come up with sustainable solutions for the sustainable management and sharing of Tista Water. There is an urgent need to re-look our neighbourhood policy! It is sad news for us that the National Geographic has listed Tista River among the eight mighty global rivers that run dry from human overuse. Be the first to comment on "And The Tista (Teesta) Weeps!"